Rhodes Communications » O Frabjous Day! You may already know this, but I just learned that today is celebrated as Drink Beer Day. I’m a great believer in the nutritional, medicinal and spiritual value of beer, and I fully intend to honor the day with appropriate ceremony. I am also considering a letter to my Congressman proposing a national holiday to mark the annual occasion. I’m sure public employees would be grateful for a day off between Labor Day and Columbus Day, and it would likely boost beverage sales. Coincidentally (possibly), this is also the peak of Oktoberfest in Munich, when more than six million thirsty guests from around the world converge on the city to consume some seven million liters of beer. All the beers served at Oktoberfest are brewed in accordance with the German Reinheitsgebot (beer purity law), which allows only four ingredients to be used in beer production — water, malted barley, malted wheat and hops – plus yeast. Adopted in 1506, the Reinheitsgebot is still in force in Germany. You may be interested to know that beer is believed to have existed in human history as far back as 4,000 BC in Mesopotamia. The ancient Babylonians are said to have developed more than 20 different types of beer, and yeast and barley have been found in the tombs of Egyptian pharaohs, presumably so they could enjoy a beer or two in the afterlife. During the Middle Ages in Europe, beer was the standard beverage at the family table, since it was deemed to be safer for consumption than water. Beer has been an important part of American life since the beginning. You can be sure it was a happy day when the first shipment of beer arrived at the Jamestown colony in 1607. Dutch settlers in New Amsterdam (now New York) set up the first brewery in 1612, and records show the pilgrims drank copious quantities of beer on the Mayflower on their way to Massachusetts in 1620. The first licensed tavern in Boston opened in 1634. By 1810 there were 132 breweries operating in the country, serving a population of seven million. 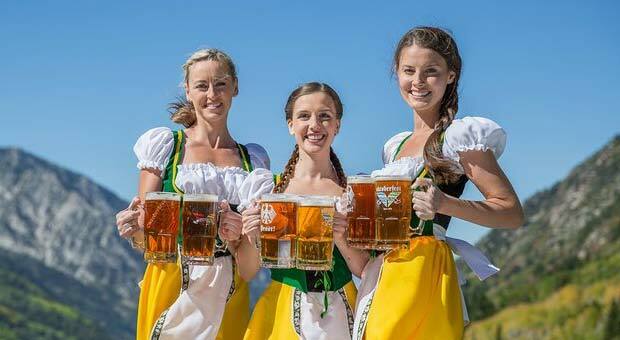 (Just about the same number of drinkers are cheerfully guzzling in Munich this week!) The number of breweries in America rose to more than 1,200 by 1860 and exceeded 4,100 in 1873. Today, I’m happy to report that the overall U.S. beer market produces more than $107.6 billion in annual sales. China is the world’s largest producer, followed by the United States. Research reveals that six percent of U.S. adults consume beer every day (the statistic, alas, do not include underage drinkers), and 55 percent of Americans are reported to drink beer while watching the Super Bowl (presumably that also does not reflect Under-21s). Craft beers now account for more than 12% of beer production in the USA, producing over 24 million barrels in 2016. My neighbor down the street has been making beer in his garage this summer. I think I’ll pay him a little social visit this evening.